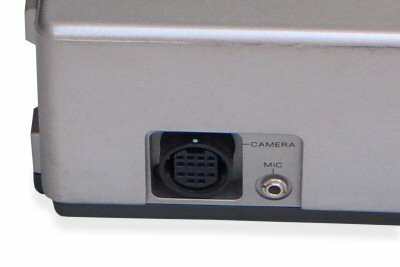 The 14 Pin Camera socket found on the side of the unit is known as a Sony K-connector. Details of the pin connections are available online. A MIC connector is also available. 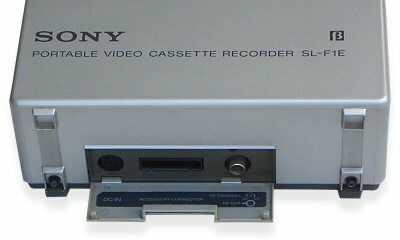 The 8-pin Din Connector is known as a Sony Multi-connector and carries a combined Audio, Video and Remote control ( later known as CTRL-S ) signals. 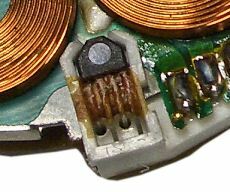 Details of the pin connections are available online. There are sometimes problems with the SL-F1 tuner failing to lock on to a TV channel. The first thing to try is to switch off the AFT. This is to cater for the case whereby it is not locking onto a signal due to a NICAM sound carrier throwing it off. Failing that, it sounds like a fault, the problem is possibly that a fuse has gone. These though are very small circuit board (silicon) fuses. They are small components labeled f-1, f-2. If you have a meter and can find them it is possible to test to see if they have blown. This is quiet common on the F1. The first fuses to test are the ones nearest to the metal can (i.e. the DC to DC convertor). This is cause by the tape which sticks to the upper drum when it is worn. It can be fixed by replacing the upper drum. 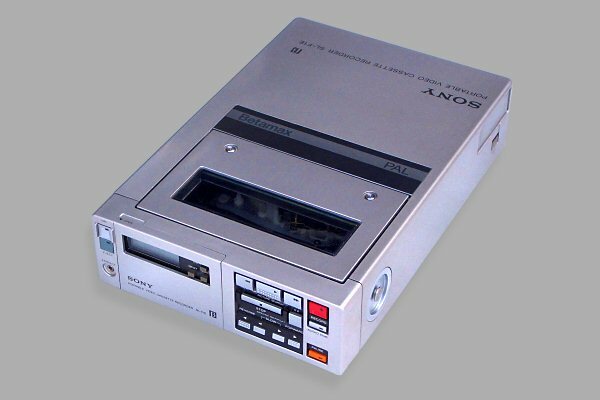 Sony now supply an improved type which is made of a harder wearing alloy. The photo below shows the new upper drum which no longer has a mounting plate. This is caused by a split threading gear. 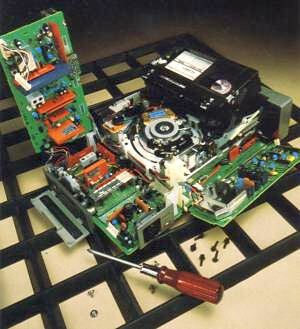 Sony now supply an improved type which does not contain the inside metal bush. In the original design this would expand and cause the plastic to crack. It is also advisable to replace the threading belt at the same time. The circuit protectors in the secondary power supplies are common to failing. Check the one near the centre of the bottom PCB first. If all fuses check out OK then suspect failure of one of the micro processors. These are surface mount components and are difficult to replace. Tracking noise bar across picture. With older machines it is not unknown for the capstan servo lock to drift slightly. This can result in what looks like a tracking noise bar permanently across the picture. The cure is to readjust the capstan bias. 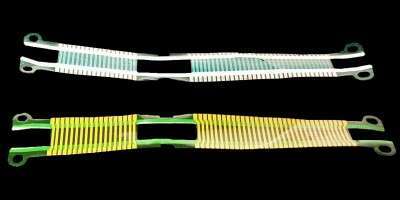 Over time, this ribbon connector is prone to fracture causing erratic behavior of the VCR. Symptoms include random operation of machine functions or loss of audio. Also pressing a button can get no response or a strange response. See also the ribbon connector parts page. channel buttons on ttf1 stuck and not responding If you have stuck channel 1 - 12 buttons on your ttf1, this solution works. Remove top, bottom and front panels, and unscrew the hh1 board from the front fascia. use a needle and drop one or two drops of light plastics friendly oil (model railway gear oil is what I used) and drop one drop per micro switch between the button itself and the barrel of the switch. Leave to soak in for a few minutes and then gently try to work each micro-switch up and down until they are all free. Reassemble your f1 and try again the 1-12 buttons. If after first attempt strange behaviour is still seen from the buttons, apply one more drop each and work the switches free some more. I had to do this twice to fully cure the problem, but now all is well again. Tuner unit TT-F1 dead (display off, all functions off, no voltage, no run...) If the 1.6 amps fuse is broken, it is probably that the power supply block called "M" has failed. If a new fuse fails also, there are a short circuits in the oscillator instead of the power unit "M". In my tuner the capacitors C618 and C619 were damaged (they appear "bigger", "inflated") and I think this caused the short circuit on the transistors Q611-Q612 that were both broken. I changed the two capacitors C618+C619 with others for 450VDC proof. I changed both transistors 2SC2938 with the BUV47 because I did not find the original 2SC2938. Replacing the two transistors, be carefully that there is a very good contact with the heat sink (use silicon paste for heat sink). instead the 2SC2938 you can fit also the BUP23 or BUW13. The first cause when the oscillator is not running, could be caused for the progressive failure of the two capacitor C618+C619. This is also the first cause of bad running of the all switching power supply system in general. Normally, replacing the electrolytic capacitor the power supply can be returning to run, but in this case the two transistor were broked....! Tape won't lace automatically If cassette detecting switch is working, check that the "thread end detection" microswitch (in the corner near camera connector) is being pressed down properly when a cassette is inserted, or recorder will just sit doing nothing; it'll play but stops after few seconds, obviously. The thing pressing the switch is adjustable with a flathead screwdriver.